Patients experiencing unexplained blackouts are set to have their hearts monitored using a new device, no bigger than three matchsticks, and their smartphone. For some time, implantable loop recorders have been fitted in patients for cardiac monitoring, but at the size of a computer USB stick, they were visible under skin, had to be surgically implanted in a cath lab, and patients had to return to hospital regularly for the data to be reviewed. “It was when I was working as a locum at another Trust that I first saw the very small devices being used. It struck me that they had so many benefits, so when I came back to Castle Hill, I made a point of getting them introduced. “Traditional loop recorders are about the size of a USB stick. They have to be implanted in the cath labs, which involves making a surgical incision and then closing it with sutures. This creates scar tissue, and the device is still very noticeable under the skin. The new loop recorders are much smaller; about the size of three matchsticks laid side by side; which means they can be ‘injected’ into the skin and the opening glued shut, making the device barely noticeable once in place. “As well as benefiting patients receiving the new recorders, there are also huge benefits for the hospital. The fitting of each traditional loop recorder takes around 20 to 25 minutes in a cath labs, whereas inserting the new device can be completed in most clinic rooms in just a couple of minutes. It’s less stressful for the patient and, crucially, frees up the time of clinicians, theatres and follow-up clinics to deal with other patients and procedures. Conservative estimates suggest we could save at least 250 clinic appointments each year by using the new devices, as well as creating considerable capacity for the cath labs. But perhaps the most exciting thing is the potential which the new loop recorders offer for round the clock monitoring. “We are currently using two small devices, the Medtronic Reveal LINQ and the St Jude’s Confirm,” Lee continues. “The LINQ device has an activator which patients can use to instruct the device to start recording, and it wirelessly transmits the information it collects at the end of each day to a secure website. The Confirm device does a similar thing, but data is transmitted by the patient, quickly and conveniently, using a smartphone app. This is one of the UK’s few physiologist-led services. 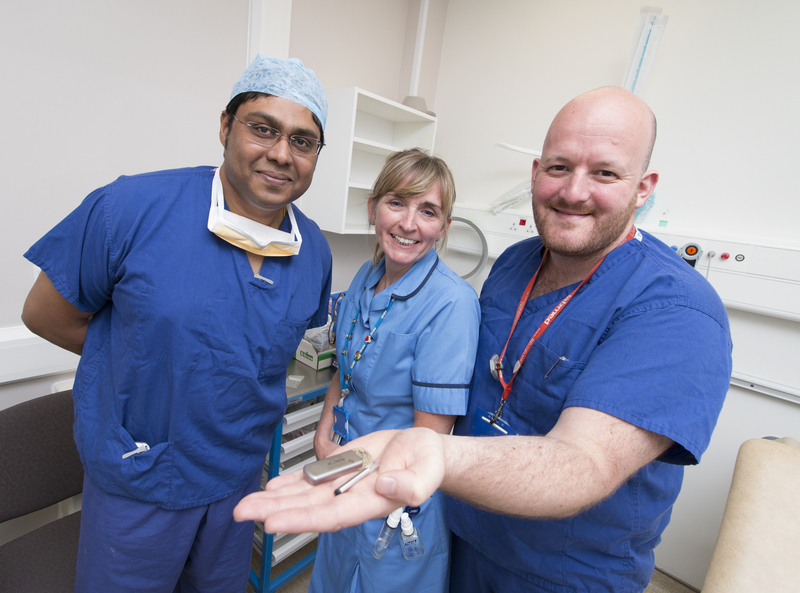 The team, comprising Lee Wise, Debbie Leggott and Renjith Antony, began to ‘inject’ the new loop recorders at the end of June in six patients, and a further eight patients received a new small loop recorder earlier this month. “The implantable loop recorders are very clever devices, and whether large or small, they can help us to identify the causes of some people’s blackouts or identify other previously undiagnosed cardiac issues, in particular atrial fibrillation (AF).